Robinson Interiors is a design firm incorporating creative, innovative, sensible design, with environmental sensitivity and sound business practices. Listening and observing allows our firm to create the best solution that exceeds our clients’ expectations, at home or in their place of business. Whether the home is a historic townhouse or a contemporary loft, Robinson Interiors is well known for its classic approach to interior design. The finished look is personal and relates to the client's own sense of style, but with Barbara's guiding influence — the aim always being for timeless design. Confident and comfortable mixing the old with the new, Barbara brings her love of great architecture and rooms with "good bones" into all her projects, where her strong background in period antiques often influences her design selections. A lifelong devotee of the great masters of interior design, Barbara displays in her own work a refined sense of appropriateness and sophistication regardless of the style. 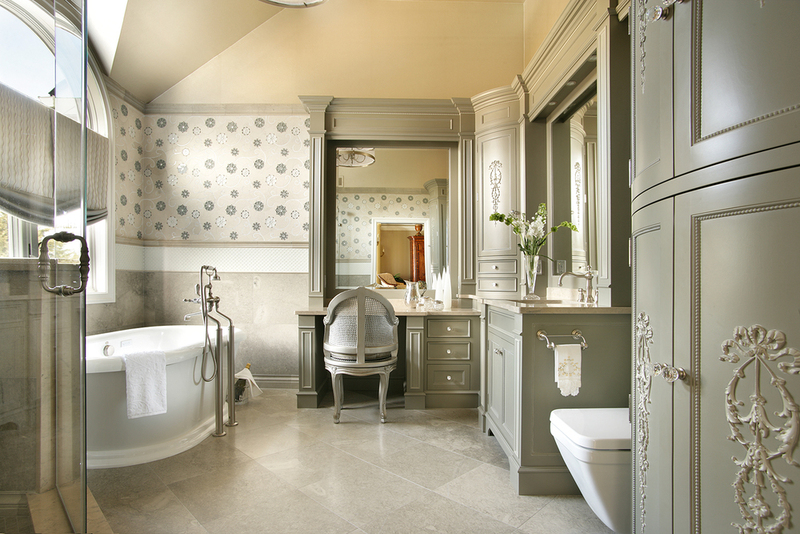 Designer Barbara Schoenfeld of Robinson Interiors updates a Monmouth County bathroom with an elegantly soft palette, interesting tile work and luxury plumbing fixtures. Barbara Schoenfeld is an NCIDQ certificate holder, which tests a designer's knowledge in a broad range of areas, including the health, safety and welfare of the public. She is a certified Interior Designer, having served as President of the New Jersey Coalition for Interior Design Legislation and many years as Treasurer. Barbara holds an Associates in Applied Science Degree from Parsons School of Design in New York and a Bachelor of Science Degree from The College of New Jersey. She has been working in the design field since 1989 as an interior designer, and has worked on residences, offices, trade showrooms, healthcare design, law firms, and many hospitality yachts from Florida to Rhode Island. A library that Barbara designed in a Colts Neck, NJ home was published in "Design NJ", titled, "A Warm Haven at Home". Barbara's design firm was mentioned in an article on "The Horizon", a 161 foot yacht, in the 2000 June/July issue of "Professional Mariner" magazine. A few years before this, the "Rendezvous", a yacht that Barbara designed the interior of, was chosen by Coca Cola Corp. for a party that the Kennedy family in Boston attended, to celebrate the reopening of the Kennedy Library in Boston. Barbara was very involved at the onset of the Freehold Area Habitat for Humanity and actually presented the first house key to its new occupants more than a decade ago, and worked in marketing and public relations for the organization. Robinson Interiors LLC believes that the interior designer's final product within a commercial or residential contract, reflects collaboration between the design team and client, which is measured by the client's satisfaction throughout the overall project, regardless of size or budget.